The Guardian have posted a good summary of the circumstances surrounding the loss of Internet connectivity in the Middle East and India last week. Apparently, the best part of 75 million users were affected, all because of a ship’s attempt to moor off the coast of Egypt in bad weather. 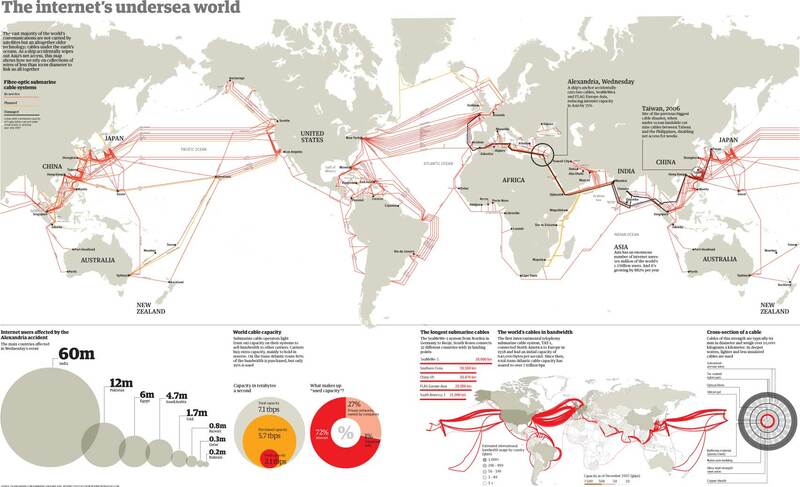 More interestingly, they also posted a link to a map entitled The Internet’s Undersea World (by Telegeography.com) that illustrates the mass of undersea submarine cables that deliver the global connectivity enjoyed by the millions of us oblivious Internet users every day. The speeds of some of those cables are just phenomenal! ← Who is Levan Tskitishvili?